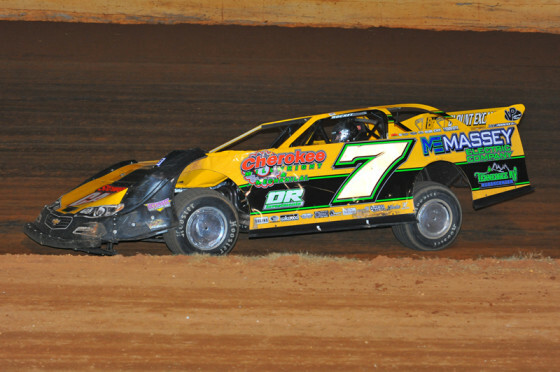 McIntosh began the night by setting fast time in qualifying when he posted a lap of 16.980 seconds around the 4/10 mile clay oval located just south of Maryville, Tenn. Chris Ferguson, Ray Cook, Ricky Weiss, Skip Arp, Kenny Collins, Anthony Sanders, Dennis Franklin, Casey Roberts and David Crabtree joined the pole winner in being locked into the starting lineup based on they efforts in time-trials. If someone simply took a look at the race summary of the Ultimate Super Late Models event at the Smoky Mountain Speedway they might see that the driver who qualified on the pole led the majority of the laps and went on to win the race and thus assume that it was not a particularly event show. That assumption would be wrong as Donald McIntosh did win the $5,000 feature on Saturday night but the evening was filled with dramatic moments. Mark Douglas and Bobby Giffin won the two B-main races used to set the remainder of the starting lineup for the main event. The first bit of drama occurred as the cars were rolling onto the front straightaway to line up for the feature race. The machine driven by Ferguson, who was considered one of the pre-race favorites, became the focus of attention. With the car leaking fuel, crew members began to work under the hood. Initially, it looked as if there was little hope of making repairs in time to take the green flag as the car was pushed to the infield. However, spare parts from the team hauler arrived just in time to get the popular driver on track and back into his outside front row starting position before the start of the race. At the start of the 40-lap feature it was Ferguson who went to the early lead after a lap long side-by-side battle with McIntosh on the race’s initial circuit. Weiss, Cook and Arp followed the lead duo during the early stages of the event. However, the complexion of the race changed on the seventh lap when Ferguson began waving his arm out the window of his racer as the cars roared down the front stretch to alert his fellow competitors that he was pulling off the track. The early leader was done for the night and the race lead was handed to McIntosh. A spin by Roger Best brought out the race’s second caution on lap 15 and set the stage for the most dramatic moment of the event. On the ensuing restart, Weiss attempted to move around Cook on the low side to take the second position. Upon completing the pass, Weiss slide up the track and into Cook’s lane. The two cars came together, sending Cook bouncing off the outside wall and then back into the path of oncoming traffic. That melee collected at least six cars, most with enough damage to be retired from the race. From that point, the race ran caution free, allowing McIntosh to drive away and then cruise to the checkered flag. However, there was intense racing behind the leader as the likes of Roberts, Collins, Franklin and 18th starting Tommy Kerr battled for positions within the top-5 during much of the race’s second half. With just two laps remaining, the third running machine of Arp slowed and coasted into the pit area with the checkered flag almost in sight. McIntosh scored his second Ultimate/Battle of Bluegrass win of the season at Smoky Mountain.